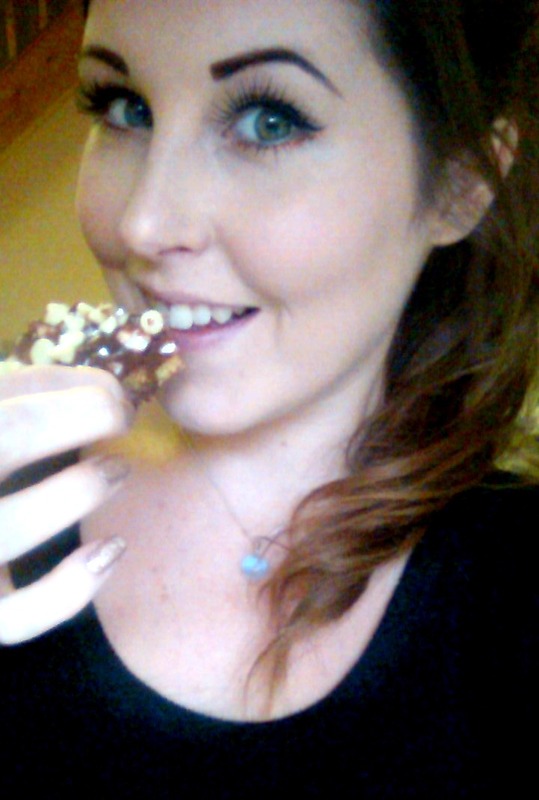 It's almost the weekend and, although they're not really a festive treat, I was really craving some rocky road. 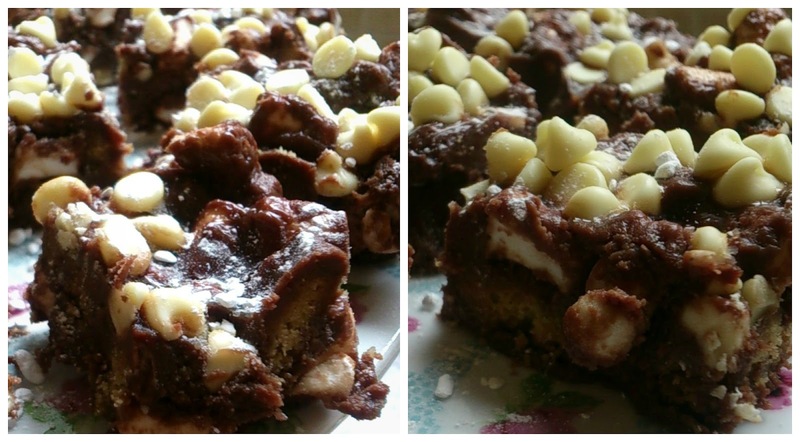 I made these yesterday and they turned out so well - fudgy chocolate, crunchy biscuits, fluffy marshmallows, juicy raisins and even some white chocolate drops, too! So, I thought I'd share the recipe and get y'all into the baking spirit! These are such an easy treat to make, and are so popular with everyone - It's just a shame you have to be patient enough to let them to set haha!
. Start by melting the butter, chocolate and golden syrup over a low heat. Keep stirring until combined.
. Remove from the heat and mix in the broken digestive biscuit pieces.
. You can then add in the marshmallows and fruit and combine, making sure all of the fillings are covered with the chocolate mixture.
. Line or grease a tin and slowly tip the mixture into it - levelling it off with a knife.
. I then sprinkled my treats with some white chocolate chips, this is optional of course, but I did not want to stir them into the mixture in case they melted & disappeared!
. You then need to place this in a fridge for at least 3 hours to let it set - try to be patient!
. 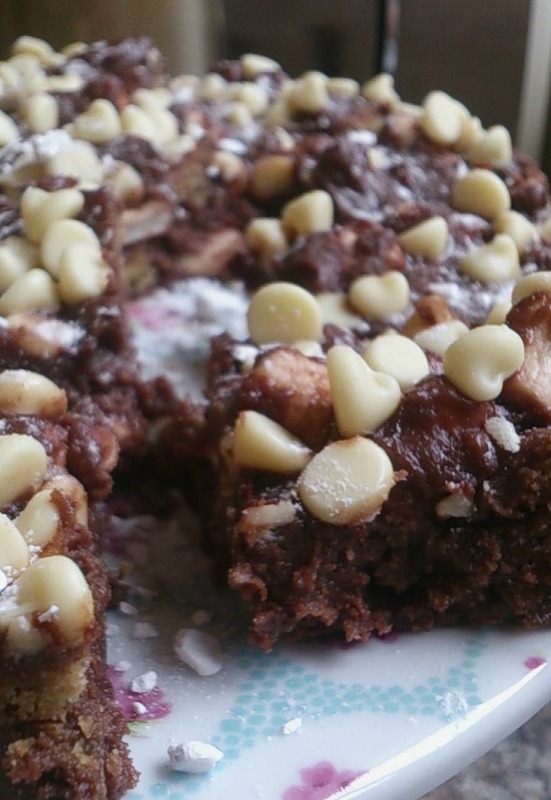 Once set you can remove from the fridge, cut into squares or bars and dust with a little icing sugar! These are so yummy and are a great bake to make with children as there is very little heat involved! They are super easy and can be made with ingredients you already have in the cupboard! Let me know what you thought and show me your turn out on Instagram with #peacelovevintage! In case you hadn't heard - Its almost Christmas! I am so excited and I just love to pick out a new outfit to wear at Christmas lunch.I have put this post together to show you some outfit ideas appropriate for whatever you may be doing for Christmas lunch this year - whether it be a family dinner, a restaurant dinner or even a party style dinner. On Christmas day I usually have lunch with my family, and, while it is not necessary to wear anything too dressy, I like to keep it smart-casual with a nice daytime dress and some festive accessories. This adorable Tartan dress from New Look is just perfect for the occasion - I actually already own it and, as well as being super seasonal, it is just so comfortable. It is a slip on dress with a little bit of give - so its perfect for harbouring that food baby after lunch ;) I like to wear tights with this dress as it keeps the look a little more casual, as well as keeping my legs nice and warm. Although heels are not really necessary to wear to my family lunch I like to dress for the special occasion, so I would opt for these cute ankle boots , also from New Look. They are comfortable and fashionable and work well with the dark colours of the dress. I'm not sure why, but when I know I am going to be eating a big meal I like to keep my hair tied back, so I think a slicked back ponytail finished off with this darling hair bow from Claire's Accessories would do just the trick! I don't wear too much make up to Christmas lunch but I think a swipe of this festive red lipstick in I'm Ready' by Make Up Revolution would look lovely and would really compliment the tartan fabric of the dress perfectly, and this gorgeous gold glitter polish in 'Champagne Kisses' by China Glaze would pull everything together perfectly! I'll mostly only be bringing sacks of presents to Christmas lunch for my family, but of course I'll need a place to keep my phone, that lovely red lipstick and my camera - and this adorable gingerbread man bag from New Look is just what I've been looking for! Some families or couples like to have Christmas lunch at a restaurant, it takes the stress, hassle and cost out of the day for a potential host and means everyone can relax with a delicious hot meal while having a few drinks. If I were having a restaurant Christmas lunch I would want to keep it formal but comfortable so I would team these gorgeous ripped skinny jeans from New Look with this dainty lace top from Forever21. It's classy and feminine but still formal enough to wear in a restaurant setting. Since most of the day will be spent sat down I would choose to wear a nice pair of kitten heels like these from New Look, they have a subtle sparkle and are oh-so comfortable and on trend! Because the top is quite fancy already I would keep accessories to a minimum. This lace effect bracelet from Claire's Accessories is just right - it compliments the pattern of the top and is just the right size to accessorise the outfit without taking it too OTT. As far as make up goes, I would keep it simple with a slick of mascara and a swipe of this beautiful deep berry lipstick in 'still missing my baby' by Make Up Revolution. It is very seasonal and will bring a nice boost of colour to the outfit. I would finish the look with a fun statement bag like this cute unicorn one from New Look. It's fun and sweet but keeps in with the monochrome theme! Some families attend a big party on Christmas, where it's nice to get fancy and dress up to the nines. It is important to remember that comfort still comes first and to choose something you are happy to stay in from day to night. This amazing emerald sequin Dress from H&M is the perfect party season piece and, amazingly, costs only £10! It is clearly a statement garment so anything you pair with it needs to be plain and simple. These shoes from Matalan will work perfectly with it and, because they have a low heel, will be comfortable for long wear-time. I would wear my hair up with a dazzling dress like this and this heart hair bun piece from Claire's Accessories is just perfect. It's quirky and fun but still elegant enough for a Christmas party! Make Up wise, I would keep it simple and natural to stop the look being too overbearing. I love this lip crayon in 'Peach on the Beach' by Bourjois. It is natural but will give your lips a dainty peach glow. To finish the look I would wear this beautiful bracelet by New Look. It s intricate but elegant and that golden tone will compliment the emerald dress well. To keep belongings safe, choose a small clutch bag like this one from New Look, it is plain enough to not take away from the dazzle of the dress but matches with the shoes wonderfully. Whatever you are doing for Christmas lunch this year, do it in style and have some lovely photos to look back on! What are your plans this Christmas Day? 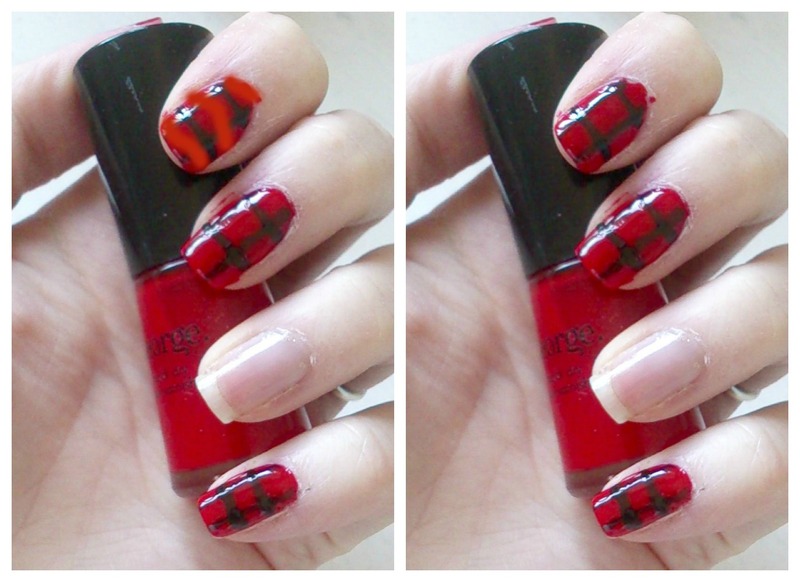 Manicure Monday | Tartan Nails! Tartan seems to be a reoccurring trend every Christmas season, and its not hard to see why - it's cute, it's cosy and, when paired with a bit of sparkle, it's oh-so festive! 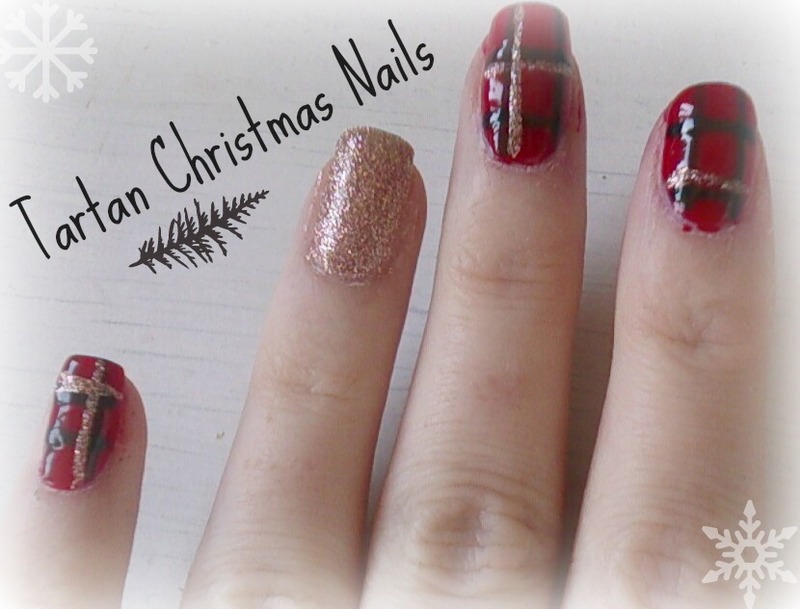 These darling 'Tartan Christmas Nails' are pretty and so easy to do, you just need to take your time over them! As with any nail look, start with a clean, dry base. Not only will this mean healthy nails, but it also means your polish design will stay chip-free as long as possible. Apply a base coat - I love the Elegant Touch 'Diamond Shield'. A good base coat will stop your nails from staining and will prevent chipping as it gives your nail polish something to adhere to. 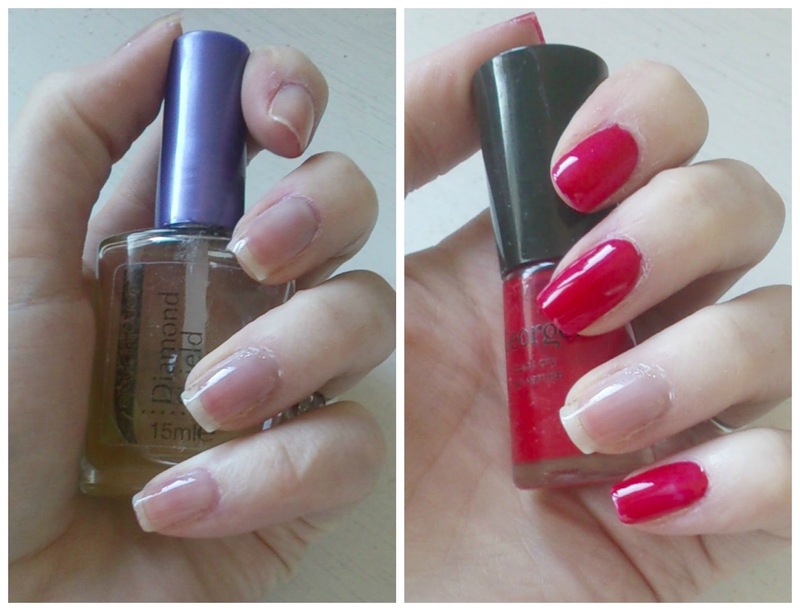 Next, paint your nails with a block matte red colour. Try not to choose one that is too dark or the black stripes will not show up properly. I am using this cherry red shade in 'Swoosh' from ASDA. Don't worry if your polish isn't completely opaque - we will be going back in with the red later on. If you like you can keep one nail 'naked' right now and paint it with later as a feature finger. 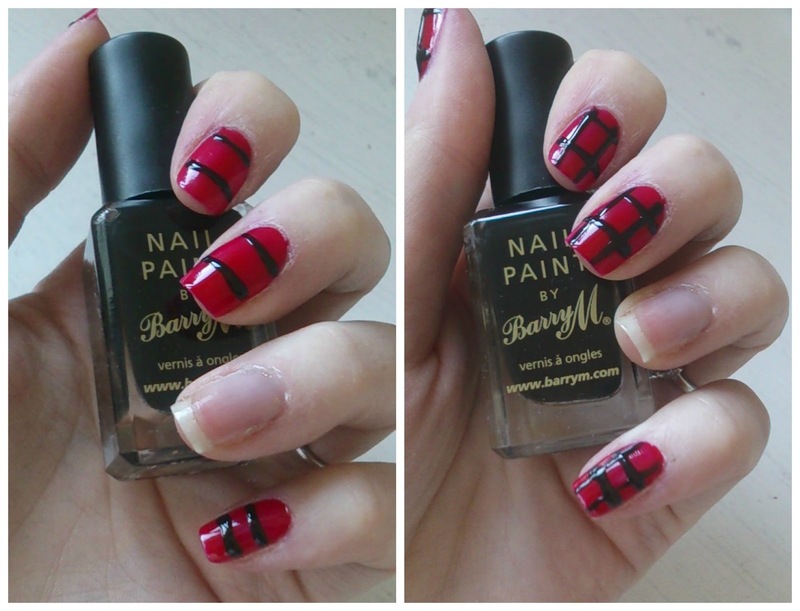 Taking a black nail polish - I am using Barry M in 'Black' - and a striping tool, create two horizontal black lines on each nail. These don't need to be mega thin, but make sure they are not touching either! 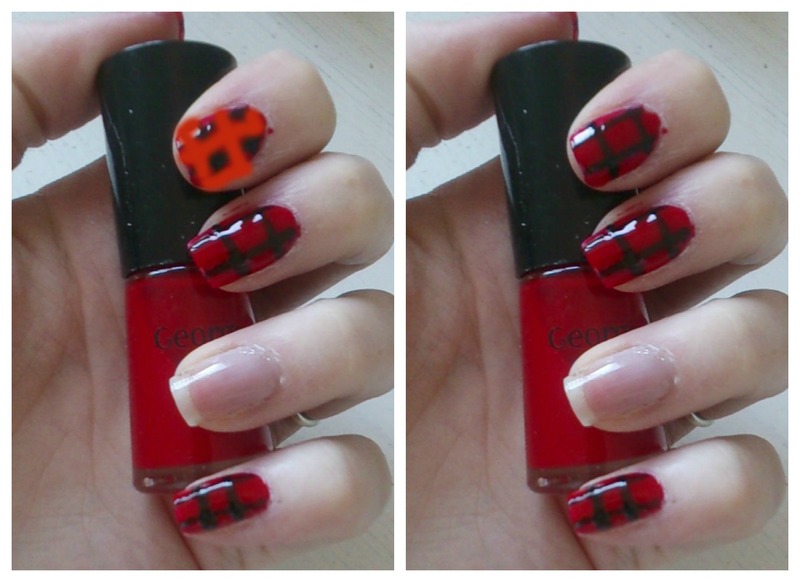 Then, draw two vertical black lines on each nail to create a tartan grid. Now, taking the same red as earlier, paint a grid over the black lines you just drew. Try not to paint over the parts where the black lines cross, though. You can see my example in the grid I have drawn in image 1 (above). This will give the look depth and dimension. Allow this to dry fully. Then you can paint over it again, this time just doing 3 vertical stripes. This will create a difference in shades and give a real fabric texture look. To finish the look, take a gold glitter polish - I am using China Glaze in 'Champagne Kisses' - and draw some accent lines on with your striper tool! This doesn't have to be the same on each nail, it just pulls the look together and makes it extra festive. You can also paint your feature finger in the same gold polish - adorable! Once this is dry, seal everything with a good top coat to ensure it doesn't smudge or chip any time soon! These nails are so pretty and will work well with even the plainest Christmas LBD, just wear a tartan belt to accessorise and some golden heels! Life Update & Instagram Pictures! I want to start by apologising for how quiet my blog has been lately - between wedding planning, pregnancy and getting a new job its been hard to find 5 minutes to do anything around here but I have found a way to manage my time better, so expect to see me around more from now! This is just a 'life update' post to let you know what I have been up to lately and to talk to you about my exciting new job! So, here are some of my latest Instagram snaps! Henry 'helping' me blow up balloons for our Halloween movie night // My Oogie Boogie pumpkin // Dan & I enjoyed a warm drink at the Durleigh Marsh Farm Cafe. As you can see I have been up to a mix of things recently and as well as this I have also been working for my new job with Bella & Bear - you may have seen my reviews of their 'Hair she goes' hair removal kit and 'Eye & Mighty' eyelash curlers. I have been working with them for 3 weeks and I am loving every second. I am blogging for them at http://bellaandbearblog.com/ as well as taking control of their Facebook page ad Pinterest boards and setting them up on Instagram, Twitter and Youtube. If you love the beauty industry be sure to follow my new journey, Bella&Bear are releasing lots of new products in the coming weeks, all of which are very exciting! I'm glad to be back and I hope you guys have been well - what have you been up to lately? 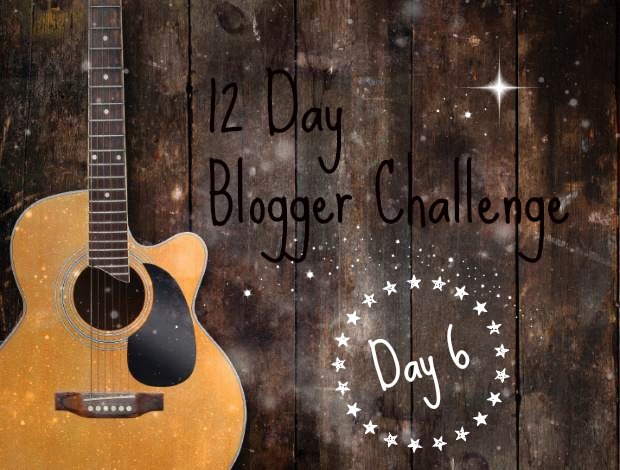 Today marks the half way point through the 12 Day Blogger Challenge. I hope you have enjoyed reading my challenge posts so far! 12 Day Blogger Challenge | Day 6; What I'm currently Reading. Shamefully, I rarely read (unless you count blogs?!). It would only be if something really struck me that I would take the time to sit and read it cover to cover. 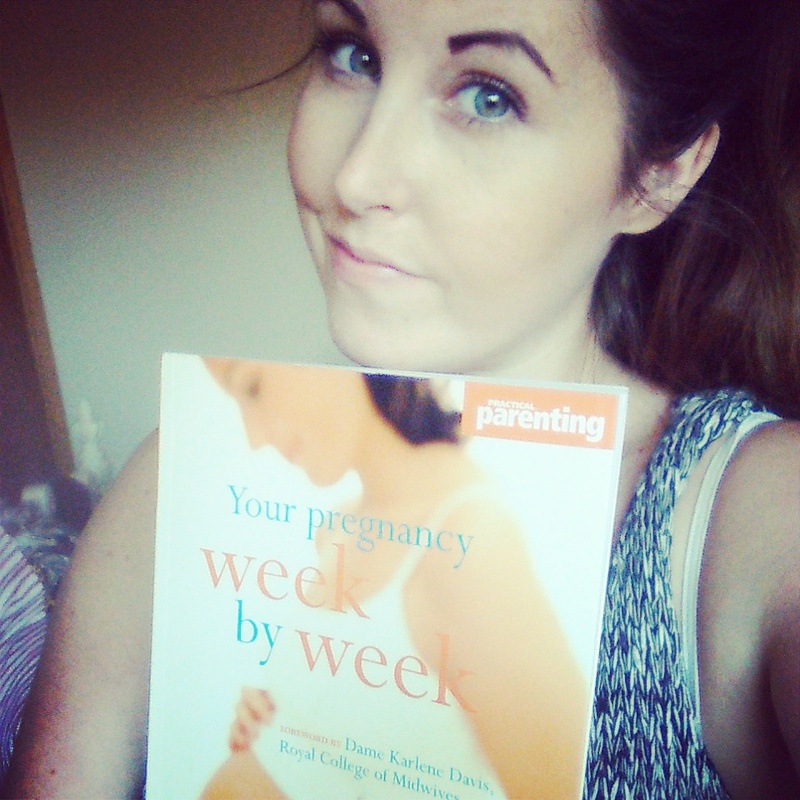 But something I have enjoyed reading these last few months is my copy of 'Your pregnancy week by week' by Dame Karlene Davis from the royal college of midwives. Dan bought me this book and it is an absolute goldmine! As well as informing me how my baby is developing and what is changing in my body each week it explains all about birth, what foods you should avoid during pregnancy, exercising during pregnancy and so much more! It has informative images and diagrams throughout and I look forward to picking it up each Tuesday (the start of my 'new week' of pregnancy) and seeing what my baby is up to. This book is also great for those trying to get pregnant or curious about the process as it explains about fertility (& infertility) and the optimum route for conception, as well as how twins are formed and how to try for a boy or girl (although I personally find this part hard to believe!). I don't know what I would have done without this book so far during my pregnancy! Right now I am 18 weeks along and, according to the book, my baby is fully developed but continuing to grow in size, he or she weighs about 100g and would fit into the palm of my hand! He or she is also making breathing movements in preparation for birth and the placenta has grown to the same size as the baby to provide essential nutrients and remove waste products! Fascinating, huh?! What have you been reading lately? Maybe it will inspire me to begin reading again!